Spectacular panoramic views from this lakeside mountain home. Enjoy sunsets from the large deck (30 feet X 20 feet) with 2 dining tables and a separate seating area. Included boat slip in 8 slip community dock just steps from the cabin for easy in/out boating. Best beach at Bass Lake. Just 100 feet to the shore with spectacular views of breath taking scenery sits this 1,800 sq.ft. vacation home for your enjoyment. The home is nestled within the Sierra National Forest at Angel Springs community, located between Millers Landing and The Forks Resort. This nicely appointed home is comfortable and spacious. Enjoy ease of boating, fishing, swimming and other watercraft activities on the lake. Take advantage of the scenic walking, hiking, and biking trails. Adventure out and explore the mountain region via all terrain vehicles. Just five minutes away from the Pine's Village in Bass Lake and strategically located close to the majestic Yosemite National Park and other popular sites. All fantastic! 'Bass Lake is a freshwater lake in the Sierra Nevada, located 14 miles (23 kilometers) from the southern entrance to Yosemite National Park. The lake is considered a 'warm water' lake with water temperatures reaching 80 degrees Fahrenheit in the summer months. Most of the land around the lake is part of the Sierra National Forest. The United States Forest Service designated the lake an official Recreation Area and has developed campgrounds and picnic areas on the south shore of the lake. Much of the area surrounding Bass Lake is devoted to the tourism industry.' The weather is warm and inviting during the Summer time, seasonally beautiful during the Spring and Fall months, and you will want to cozy up next to a warm fireplace on cold Winter days. 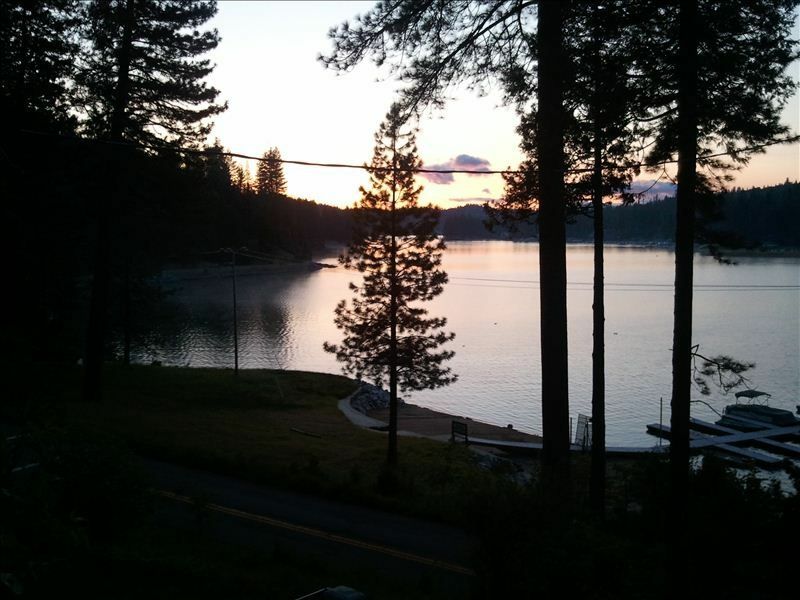 Bass Lake is a great place for families with children, outdoor enthusiasts and others. Inquire about multiple week and off-season specials. See the Bass Lake CA Webcam, Events Calendar, and Area Attractions link (Path to marinas and many area sites, including Yosemite National Park) in the 'Links to More Information' section. I operate a tour and travel agency that specializes in overseas travel. My wife and I live with our 4 kids just 1 hour from Bass Lake and have been able to make many family memories here. The finest view at Bass Lake coupled with and excellent boat dock and beach area. You will find the cabin is fully stocked with all conveniences and maintained like a home, not a rental The location between the lake and the Sierra National Forest gives you maximum privacy in a forest setting - yet close to everything. The upstairs has two huge bedrooms and one full bath, the downstairs a bedroom, full bath, family room, kitchen and laundry room. Rarely needed. We are on the cool side of the lake. We have a few families that vacation together each summer as a way to unwind from the school year behind us and get us energized for what lays ahead in life. For us, Bass Lake is the perfect place to do just that. Relax, enjoy each other's company, and play on the water. This cabin gets a thumbs up in all those respects. It is well maintained, has gorgeous views of the lake from the enormous deck, and a boat dock that the property manager set up for us in advance. Very nice! One challenge with the dock area, if one wants to call it that, is that the dock is set up for all of the nearby properties on the lake so all of the families are sharing it. That meant we were not allowed to sit out at the end of the dock and just enjoy the view of the lake. It's a small thing, but none the less one should know that in advance. The grass/sand area in front of the dock is large enough for all families to put up their EZ-ups and not feel crowded. It would have been nice to have our own dock/sitting area but it is certainly doable. Be careful walking across the street to the dock though as cars cruise around the blind corners quickly. The interior has the cabin-feel going it really well. Right out of the movie "Grown Ups!" Plenty of room for interaction as well as quiet time as needed. Outside, there's a great firepit for campfire songs and smores! Propane grill works great. Plenty of parking although the driveway is pretty narrow driving up. We left our boat trailer in the turnout at the base of the driveway and nobody bothered it for the week. Have to be careful of the week you come to Bass Lake as the crowds will pack the lake with boats and jetskis at certain times and make anything but tubing impossible. Our week was great. Usually only 4-5 boats out at any given time, but it got busier towards the end of the week. Beyond boating/tubing/skiing/wake-boarding, our favorite thing to do was load up everyone in the boat and head over to the very south-east, dam end of the lake and anchor in the super calm waters deep in the alcove and just float. We'd turn on some tunes, have a few beverages and just float. Heaven! Directly across from the dock is Willow Cove where a tree swing is hanging and enjoyed by everyone screaming as they swing down over the water and jump into the lake. No Bass Lake trip is complete without several visits to the Forks Resort for one of the best burgers ever made. Add some of their yummy ice cream at the end and you've got happy campers! My husband and I love to spend time with the family. We have spent many summers going to Bass Lake and have many wonderful memories of our stays at Bass Lake. This past summer we had the pleasure of staying at this lovely cabin. We had all the comforts of home and a heavenly view of the lake. The cabin is clean and is stocked with all the kitchen utensils our group of ten could need. All the appliances were well taken care of and worked well. There were plenty of beds and they were clean and comfortable. We are looking forward to next summer and another awesome time at this very beautiful cabin. This a great location for a family vacation. Lake is easy to walk to, swimming is great and safe. Cabin is well maintained. Owners responsive to our needs which made for a great stay. This is a wonderful, comfy vacation house! The view from the deck is amazing! It is steps from the lake with an easily accessible boat dock. The house can comfortably sleep 12, although we did not have that many people. The house was clean, spacious and set in a quiet atmosphere. The owners were friendly and easy to work with. We would recommend this lake house to anyone! It makes for an outstanding vacation with lasting memories!